This year I have been inspired to try new things, mostly in what my husband and I do on our date nights. No matter what we do, I always enjoy my time with him. However, I do want to span our horizons beyond a movie and dinner. Thankfully, my husband is more than happy AND willing to try all these new things with me! Our 11th anniversary was just a short time ago. We made it our goal to do something different, something new. I’m excited to share with you that it was a success!! Here’s what we did! 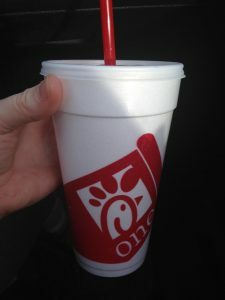 Just recently the western Michigan area has been getting some Chick-fil-As. For some of you this is no big deal because you’ve always had them around. We, however, have not. And we really haven’t been in any areas where they were around. But we’ve sure heard about them! There is a lot of hype around their chicken and their special sauce. So because we needed someplace quick to eat, and this restaurant is now around, we decided to give it a shot. Lol – here is a shot of me holding their cup. We actually shared a cherry coke. This after we remembered we were supposed to try their tea. Whoops! I guess we’ll have to go back and try it again! Overall, it wasn’t a bad experience either. The sandwiches were good. The waffle fries were sure different. I’d go back again if we felt like chicken. I think the best part, though, was the sauce. OH MY GOODNESS, that sauce is really, really good! I liked dipping my fries in it, and I loved putting the remaining sauce on my sandwich!